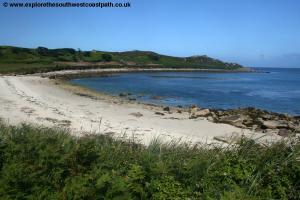 Tresco is well known for it's beautiful Abbey Gardens, which thrives due to the mild climate on Tresco with it's shallow water and relative shelter offered by the other islands. 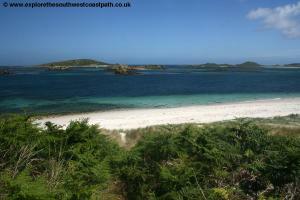 Like all the islands, Tresco has a wonderful variety of scenery on it's coastline and this walk takes it all in, from the beautiful sandy beaches on the east coast of the island to the rockier northern coast. 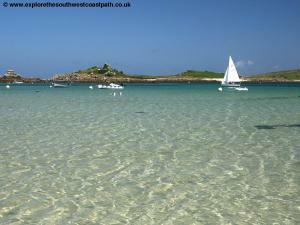 Tresco is a very popular island to visit and as such is well served by boats from the other islands. 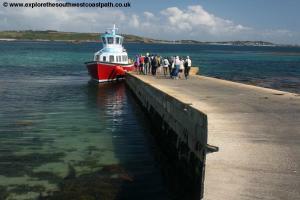 There is normally a daily service from St Mary's to Tresco, with several crossings normally provided each day. 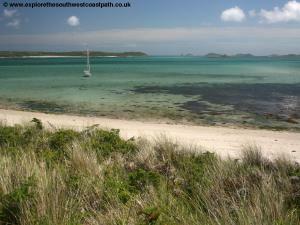 From the other islands there is a boat most days to Tresco, although usually with a single out and return journey. Note that due to the tides it is common to be picked up and dropped off at different points. At high tide the quay at New Grimsby on the west coast of the island is normally used, whilst at low tide the quay at Carn Near (the southernmost tip of the island) is used. So bear in mind that when walking round the island to make a complete circuit you may need to factor in the extra distance to re-walk the coast between New Grimsby and Carn Near. 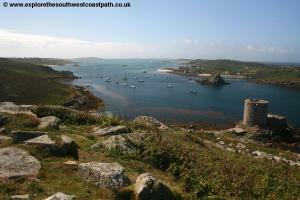 Tresco also has links with the main land, with a helicopter service running most days from Penzance. This runs twice per day Monday – Friday during the winter and 4 times a day Monday – Saturday during the summer. Day trip fares are £110 from Penzance whilst single tickets and period returns are also available. The service is operated by British International Helicopters. Flights take around 20 minutes. From July 2012 the heliport in Penzance will close and the service will transfer to Newquay Airport. This will result in both longer journey times to Tresco and an increase in costs, due to the 'Airport Development Fee' charged at Newquay Airport. 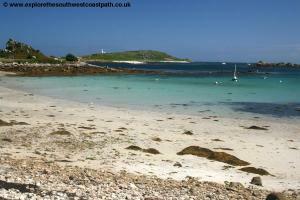 Tresco is the second largest of the island and as such there is more accommodation than on the smaller islands, although it tends towards the luxury end of the market. The Island Hotel is an 'apart hotel' offering one bedroom cottages with kitchens on a bed-and-breakfast or half board basis. 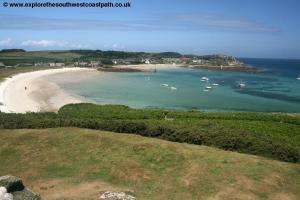 There are also several holiday cottages including the Flying Boat Club, a complex of twelve self catering properties. You can also stay at the New Inn on a bed and breakfast basis. 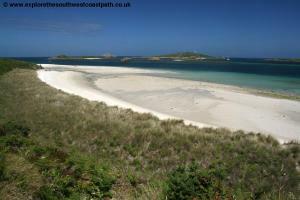 All these properties can be booked on the Tresco Accommodation page, which also includes a brochure. 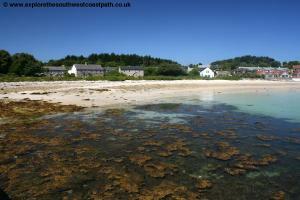 Boro Farm offers a choice of self catering properties to rent on the island. 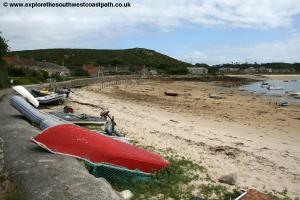 The walk starts from the quay at New Grimsby, which is roughly mid way along the west coast of the island. 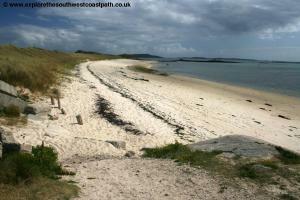 However if you arrive when the tide is low you may be dropped off at Carn Near on the south tip of the island instead. From the quay at New Grimsby walk up the quay and just before you reach the toilets on the left, turn left and then take the low coast path, right along the back of the beach. 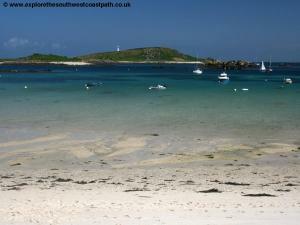 You have fine views over the shallow waters of New Grimsby Harbour on the left and to Bryher beyond. 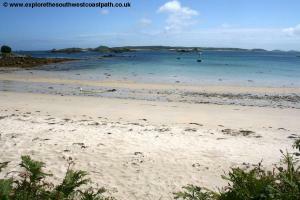 It is possible to wade between the islands at particularly low tides, so shallow is the water here. 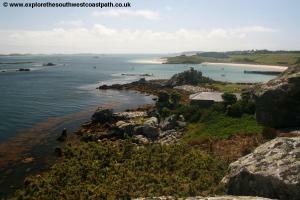 Soon you come to the rocky outcrops at Braiden Rock where you continue on the main coast path straight ahead. 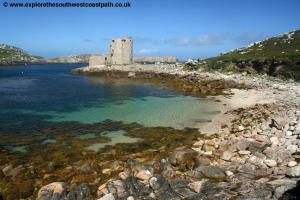 Once past this you soon come to the sandy and rocky beach of Castle Porth ahead, behind which is the castle tower. The tower dates from 1651 and is now in the care of English Heritage. 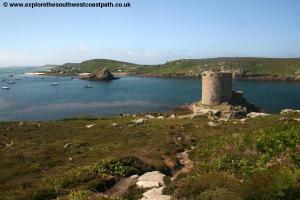 Admission is free and you can also climb to the top of the tower, for fine views over Tresco and over to Bryher. From the castle the coast path now heads a little inland and climbs to the ruins of a second castle. This is King Charles' Castle and was built between 1548 and 1550. 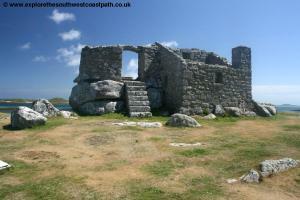 Now all that remains is the ruins of the outer walls and it is also in the care of English Heritage and free to visit. From the castle continue due north, ignoring the wider paths that go off to the right. 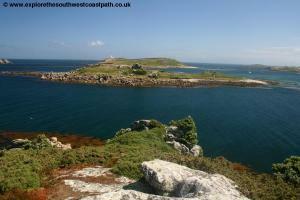 This soon brings you out to Gimble Point, the most westerly point of the island. 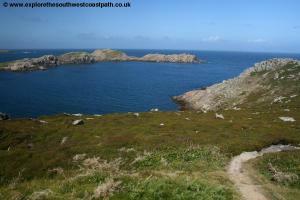 Continue on this obvious path right on the cliff tops to come to the next headland, Kettle Point. Looking out to sea can be seen the small rock called Kettle after which the point is named. Just past this you pass the rocky beach of Cork Porth and here ignore the wide path heading inland to the right away from the coast, and continue on the coast path ahead, with the sea on your left. Soon you reach the north east point of the island, where there is a small cavern, Pipers Hole. 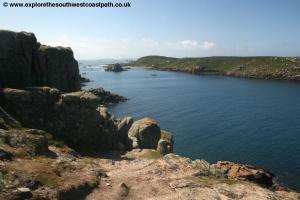 Continue round the coast past another rocky outcrop and beyond that, to reach the bay of Gimble Porth, where you follow the wide path around the back of the beach. The beach is is mostly rocky but there is some sand at the south edge of the beach. 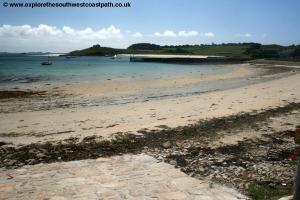 At the south end of the beach, the path ahead splits. Ahead of us along the coast is the Island Hotel and the grounds are private, so here take the right most fork to meet the wide track (one of the roads on the island) and turn left along this and follow it heading due east down to Old Grimsby Harbour. 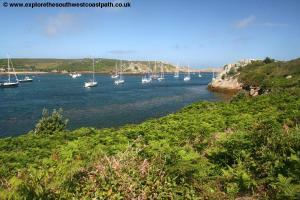 This is an absolutely beautiful location, with a lovely sandy beach and numerous boats moored in the harbour. 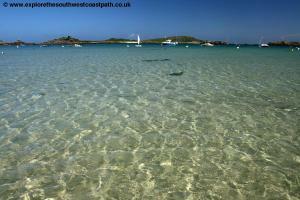 The water is very shallow here, making the sea a wonderful turquoise colour. Follow the road along the back of the beach, in front of the houses to the old Quay. Turn right here passing the back of some houses on the left and when there is another track off to the left, take this. 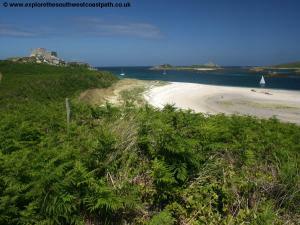 This wide track goes behind the back of another stunning beach, Green Porth. 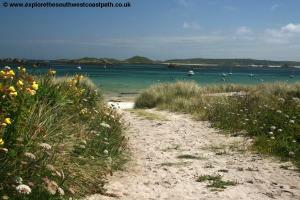 There are several paths off to the left through the dunes if you want to visit the beach. 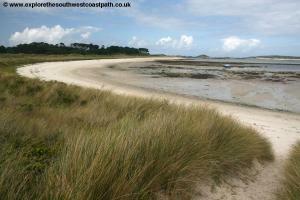 As you near the eastern edge of this beach the track splits, with a smaller track going off to the left passing some cottages (Blockhouse Cottages). Take this smaller track and when it splits again, keep with the left fork. 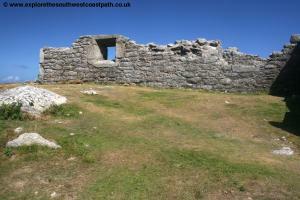 The main path then goes to the top of the Blockhouse, an old 16th Century gun tower. 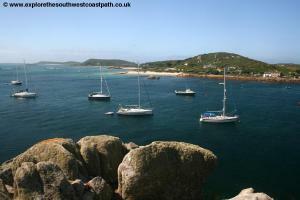 It's worth taking this for the wonderful views over the island and the surrounding coast line and to the other islands. Returning to the path as it descends back down fork right on the more minor path that goes around the bottom of the hill and closer to the coast, rounding Block House Point. 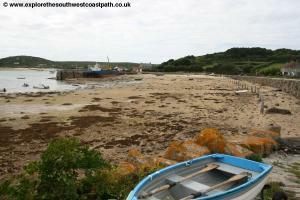 Once round the point you have another wonderful sandy beach, Borough Beach. Keep to the lower coast path and soon a small path leads through the dunes to this beach if you want to explore the beach. 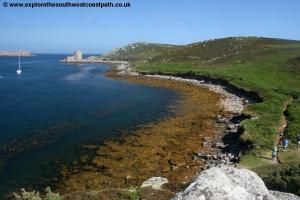 Continue ahead on the coast path and keep to the left most path when it splits. 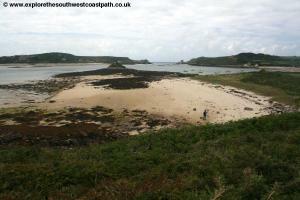 This soon rejoins a larger track where a path leads off to the left down to the beach again. Keep on the main track soon reaching Rushy Point. You're now passing another glorious beach on the left. 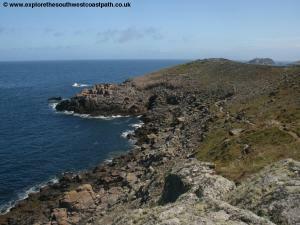 The wide track continues to the next point, Lizard Point. 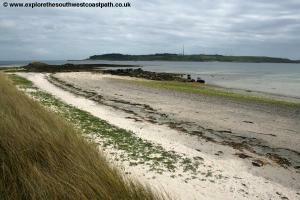 Continue round this on the obvious coastal path now running alongside Pentle Bay. 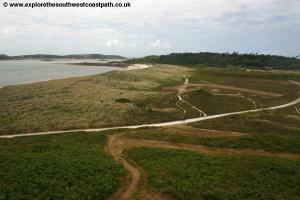 Whenever the path splits, keep the left most fork, but ignoring the paths sharply off to the left that lead through the dunes onto the beach. Soon the path heads a little inland and joins a wide track heading due west This will take you to the Abbey and Abbey Gardens (which are worth a visit). 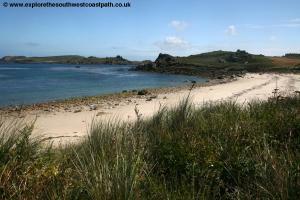 However to continue on the coast path, turn left on the path heading for the beach and a few metres later, turn right off it on a more minor path behind the beach. This soon joins the main track and comes to small clearing, which is an area used for storage, where there are some metal containers. 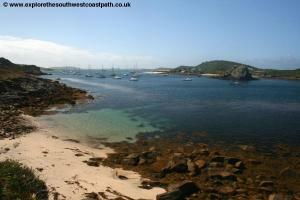 Here a path off to the left leads out to the beach and Skirt Island, a rocky little islet just off the coast. Don't take this but instead fork to the right on the track that soon runs behind the beach once more, now heading due west with the sea on your left. 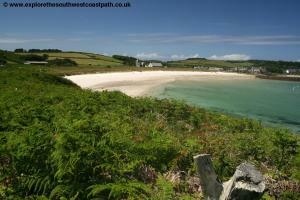 Continue behind this lovely beach as the track soon turns a little to the right and slightly back from the coast. Soon the track splits, with similar width tracks going left and right. 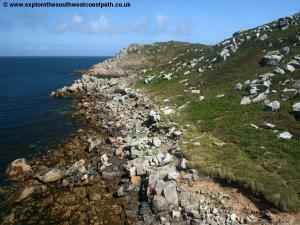 Fork left here and continue left when it joins another wide track ahead, heading down to the slipway at Carn Near. 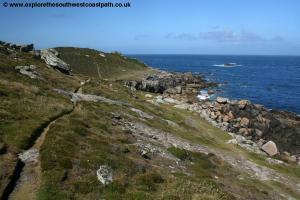 As you approach a rocky outcrop, just before you reach it turn sharply right on a small path through the heather now heading due north along the west coast of the island. This goes behind another gorgeous beach, Appletree Bay. 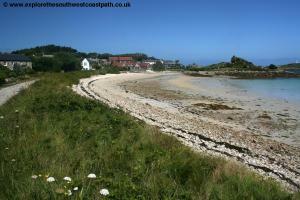 Nearing the north end of this bay, the track soon joins the road from the Abbey and gardens. Turn left here, along the road. The road now winds it's way parallel and a little above the west coast of the island, It soon joins another road from the right , Abbey Road, and you turn left here, continuing in basically the same direction you have been going. 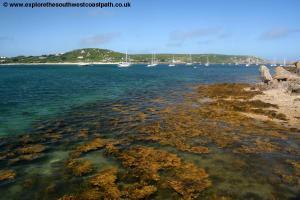 This soon enters the town of New Grimsby, passing the Tresco Stores on the left. 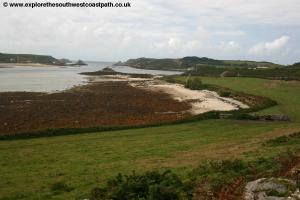 Keep straight ahead here, soon following the coastal road past some houses on the right and then soon past the New Inn. Now simply follow this road along the back of the harbour to return to the quay at New Grimsby, your circuit of the island complete. 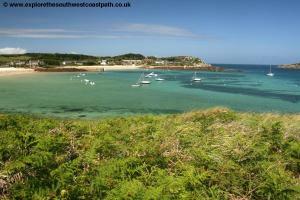 This is a circular walk round the island so of course you end up back where you started! However in many cases and as previously mentioned, you'll often need to return from a different quay from your arrival point, so make sure you allow sufficient time to get to the appropriate quay. At high tide boats normally use the quay in New Grimsby, but at low tide they use the slipway at Carn Near, the southernmost point of the island.